OLDRIGHTIE: Sour Grapes or Not. How can this continue? Greg Smith resigned from Goldman Sachs and wrote a scathing expose of the greed of this "Bank" and their like minded cohorts in the global financial, quasi legal, apparatchiks' new world scheming. In some respects their approach to the fortunate celebrities and similar clients from amongst the political and gangster fraternity is almost understandable. Where it all falls down is the manner this attitude pervades all the way down to lesser institutions and their exploitation of the more ordinary and in many cases vulnerable clients and investors. We can be certain that the dismissive and unpleasant sneering is endemic in virtually all those whose knowledge of the disdainful aspects of modern life in Western culture is regarded as a quality top enjoy. The poor, disadvantaged and just plain ordinary people are only for exploitation. The instant, obsessive and unhealthy desire for superiority and untold, unjustified wealth on an ever expanding scale knows no bounds. Just think of the offspring this nastiness spawns. Sexual depravity is one "perk" that the self appointed hierarchy demand. Berlusconi and Strauss- Khan being just a couple of idiots for whom the need to be seen as studs and powerful rutters, almost more important than the acts themselves. Naturally for others in the club, private jets, mega fortunes and high living are just as publicly embraced. All of this is done in the belief their positions in the pecking order negates their being subject to the Goldman greedy smirk we are enslaved to. As this hedonistic circus plays out its untold number of acts, the poor get ever more increased in numbers. The wars become ever more desperate in the need to wrestle with the forces of time. The fear stalking these people is almost as nasty as the poverty they bequeath others. As the EU gallops defiantly through the valley of death, towards the cannons of debt, (I don't care if that's a mixed metaphor), it is of little comfort that we will be required to suffer more than their ilk. For sure they will have salted away the field dressings and plasma supplies, which will be denied the rest of us. We will be forced to witness their agonies assuaged with morphine whilst our own little lives ebb away in starvation and mortal wounds. All in it together, you see. We may be flat broke but the hoi poloi still manage to lavish ever more piles of borrowed dosh to entertain the entertainers. No wonder they are so smug and happy to laugh so broadly at we mere mortals. The celebrity special ones sharing the top table's mirth at we unfortunate tab payers. That's my pension you just gulped down in one starter. Hateful people. 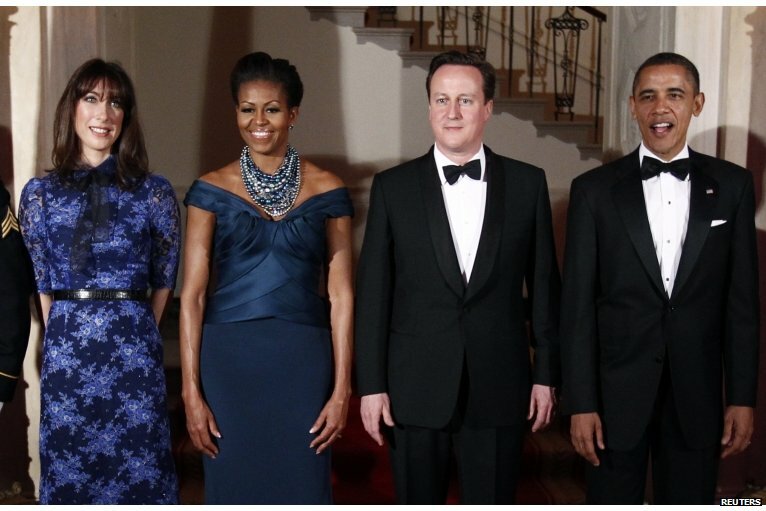 As an aside, Sam Cam looks less than happy on this trip. Has she picked up the hints of The Boy's intimate relationship with the Red head out on bail? We are the hoi-poloi. They are just a pair of twits! I guess you have a point, Jonty but they don't agree!